The new Joseph Joseph placemat and coaster sets are an innovative alternative to the everyday place setting. A simple but appealing concept that allows the coaster to be situated in or outside of the placemat. Manufactured from toughened glass with non-slip feet this set will both protect and add colour to your table. 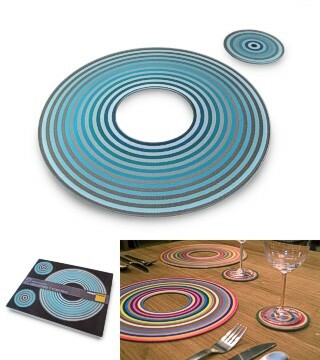 Set of 2 placemats 30cm (12 inches) in diameter and 2 coasters 10cm (4 inches)in diameter.